This continues our series learning about Jesus. This is week 2 in the fourth quarter of a year of Preschool Bible Study that I assist with on Wednesday evening. 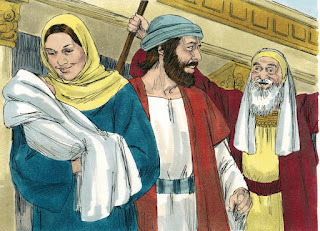 They lived in Nazareth and had to travel to Bethlehem to be registered (counted). There were so many people, they had to stay in a stable. When Jesus was born, Mary wrapped Him up and laid Him in a manger. Shepherds came that night to visit Jesus and they were so excited to see the Savior! We used the above picture for the then and now place to worship. I printed it, folded in half, and could flip it around for the discussion. Most of us worship God in a church building. (This is a building. The people are the church.) Some people worship in a house, a tent, outside or where they can. Where else can you worship? When Jesus was a baby, People worshipped God in a temple. The temple was a beautiful, large building in Jerusalem. Click here to download the visual. 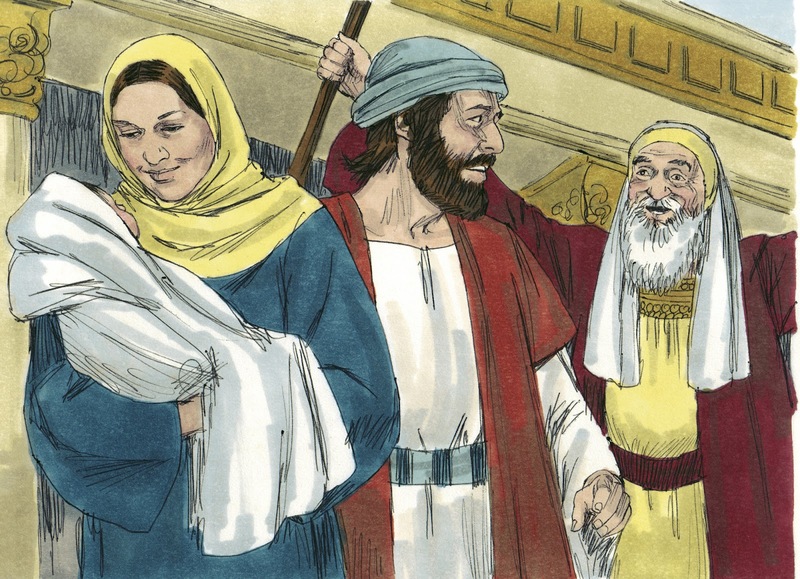 When Jesus was about one month old, Mary and Joseph took Him to the temple in Jerusalem. They took an offering to God. This offering was part of the Old Law. There was a man named Simeon that lived in Jerusalem. He was a very good, faithful man and he had been waiting a long time to see Jesus the Savior. 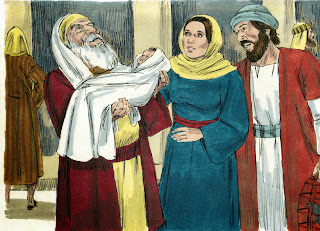 Simeon was in the temple when Mary and Joseph took baby Jesus to the temple. When Simeon saw Joseph, Mary and baby Jesus, God told him that this was the special baby he has been waiting for! Simeon took baby Jesus and held Him. Simeon thanked God that he was able to see Jesus the savior! Simeon told Mary & Joseph that Jesus would be a helper for people. Mary and Joseph were so amazed at the things Simeon was saying about Jesus! There was a lady named Anna that lived in Jerusalem also. Anna was 84 years old and she stayed in the temple serving God. Anna prayed day and night! Anna was so thankful when she saw baby Jesus. She told other people about Jesus. Anna knew that God had sent Jesus to help the people. This foldable is Mary & Joseph at the temple. Anna and Simeon are attached to craft sticks and the students can move them around to re-tell the Bible facts. See more here for this project. Click here to print the visuals used above. Click here to print extra visuals for this lesson. You can see more for Anna & Simeon for preschool here.